(WHEN YOU COMPARE RATES PLEASE NOTE THAT ALL OF OUR POSTED RATES INCLUDE ALL REQUIRED FEES EXCEPT TAX!) YOU'LL NEVER FIND A BETTER VALUE FOR A 3BR POOL HOME IN SEA PINES IN THE SUMMER SEASON!! SEND US AN INQUIRY AND WE'LL SEND YOU A QUOTE. You can unwind at Starfish Cottage, a beautifully remodeled, light and bright vacation home in one of the best locations in Sea Pines Plantation! This very private single family home is filled with every amenity to make it a place you can call 'home' for your vacation. Featuring a private pool and spa, decorated in an upscale “beach” decor with new porcelain tile floors, this home is a beach-lovers paradise. Enter the cottage into a large open living room where a wall of French doors extends all the way across the back, opening to a large, beautifully furnished patio with a gorgeous pool and spa, and with wooded and lagoon views. The sound of the pool’s waterfall, the lushness of the giant moss-bearded trees and the native shrubbery, and the sheer beauty of the Sea Pines area create an environment so soothing that your day-to-day cares will vanish. Sit back and relax! Enjoy the upgraded eat-in kitchen with classic tumbled marble tile countertops. The kitchen features a large side-by-side refrigerator with through-the-door ice and water dispenser and is well stocked with dishes, glassware, pots, pans, and everything you need to cook and dine at home. Enjoy the large patio and pool area with a new gas grill for your outdoor dining pleasure. The private pool and/or spa can be heated upon request ($250 extra) from September to April. The master bedroom and queen guest bedroom each have a private access to the beautiful pool area, where you can enjoy the lagoon view and completely private back yard, pool and spa. The open floor plan offers everything you want for a family vacation or a romantic get-away. This vacation home is one of the few that you will find on Hilton Head with an eat-in kitchen as well as a separate dining room. The living room boasts a wall of built-ins where you can pick out a great book to read inside or out by the pool. You won't have to miss your favorite TV shows or sports events because there is a 47' LCD, wide screen HDTV and DVD player in the living room. There are also televisions in each of the three bedrooms with full cable access. You can access the internet anywhere in the home or poolside via a wireless broadband signal. We even offer a CD/iPod player, so bring your iPod or your favorite CDs and enjoy your music. All three bedrooms are spacious with quality bedding. Luxury linens are provided. Both the master bedroom with king bed and the second bedroom with a queen bed have their own private bathrooms. Including the spacious third bedroom with two twin beds, the house easily accommodates six to eight guests. We provide a queen-sized elevated air bed to accommodate extra sleeping needs. You won't find a more inviting, light and airy home on Hilton Head Island ... we looked a long time to find the perfect vacation house, and we believe that Starfish Cottage is it! Come and relax at our newly remodeled home...a wonderful piece of paradise that we welcome you to enjoy. At your doorstep are an array of activities, including world-renowned golfing and tennis as well as biking, hiking, fishing, and lazy days at the beach. Tennis players can use the FREE Greenwood Forest court or may opt for one of Sea Pines’ nationally-ranked tennis clubs with lighted clay courts. Guests are welcome at the clubs. World-class golf within Sea Pines awaits you, with the beautiful Ocean course, the Pete Dye-designed Heron course, and the magnificent Harbour Town Links clubhouses all within a two-minute drive from the house. You can also enjoy dozens of other courses on Hilton Head Island. The cottage's location within Sea Pines Plantation allows you to easily walk to shops, ride your bike along the many miles of bike paths or to the Sea Pines Private Beach Club (a 12-minute bike ride) or to many of Sea Pines’ other beach access points (nearest one is a 10-minute bike ride). The house is just a fifteen-minute walk to Harbour Town, one of the most popular areas in all of Hilton Head Island. Just down the street from the house are the FREE Greenwood Forest neighborhood amenities - playground, swimming pool (great for swimming laps), basketball court and tennis court. In the house you'll find beach chairs, a beach umbrella, and a cooler for your convenience. You can drive all this equipment to the Sea Pines Beach Club in about two minutes, where you can enjoy the beautiful beach, food and bar service with an ocean view, showers, restrooms, a beach store, and seasonal activities for children. The beach is attended by lifeguards during the summer season. If you prefer a more remote beach experience you can bike or walk to any of dozens of beach access points along Sea Pines’ 5 miles of beach. History buffs will find much to see and do on or near Hilton Head, which is located in an area steeped in Southern culture and tradition. St. Helena Island, home to the unique Gullah people, is an easy day trip by car, as are Savannah, Charleston and Beaufort, all prominent Civil War towns. 'The Spirit of Harbour Town' tour boat conducts daily round trips (with a four-hour tour layover) to Savannah during the summer season. Robert & Ramona Wolf (Bob and Ro) have been vacationing in Hilton Head for many years while raising their family. The dream was to possibly own a home to take advantage of all that Sea Pines has available – beach, golf, bike riding, great restaurants and shops in a peaceful and relaxing vacation spot on the island. Excited to have found the perfect home to make our dreams come true – Starfish Cottage. Starfish Cottage is on Hilton Head Island. It's in Sea Pines Plantation. Do we really have to explain more? This house would be a great vacation home even if it were not so well located. Relaxing inside the beautiful living room or out poolside, listening to the waterfall and enjoying the lush view, what more could you want. We also love that we can easily walk or bike to restaurants, shops and the beach. Don't get too excited about this. If you stand on the deck, you can see the lagoon. It's about 100' away. Large side-by-side with in-door ice and water dispenser. Integrated water filter. Beautiful deck surrounding new pool - lots of room to use the gas grill and to eat liesurely poolside meals. Beautiful private pool and spa with waterfall and colorful night lighting! Lovely, quiet house close to everything in Sea Pines. Well stocked and well maintained. We enjoyed our stay at Starfish Cottage. It was the perfect size for the 4 of us. Very quiet , beautiful neighborhood. The property manager was very easy to work with, and responded to questions and concerns promptly. I would stay here again. The house was perfect for our needs, with two bedrooms on one side, and another that's separated by the main living space. We enjoyed the pool, the kids rode bikes in the cul-de-sac, and we were able to get to everything in a few minutes! The only negatives: the kitchen needs a little TLC to be up to par with the rest of the house, and it's probably time for a new grill. :o) Thanks for the stay! Very cute house in a wonderful area! We had a great time. The house is very cute, and had everything we needed. The kitchen is well stocked with equipment/dishes, etc. The beach is only a 5 min drive and was well worth it. The area itself was very nice, in a quiet gated community which we really enjoyed. The property manager & owners are extremely nice & helpful with anything you may need. Highly recommend this little slice of paradise! Great location, loved our Seapines experience! My family of five had a very enjoyable stay this property. The house was perfect in size and in a fantastic location to everything! I gave it only 4 stars because it is in desperate need of some improvements and refurbishing. Bedroom in the back by the kitchen has no operable window and it gets very warm in there during the night. If we go back, I’ll definitely bring a fan, but overall had a very enjoyable and memorable vacation. Coming back to a home where we could all be together and comfortable at the end of the day was the best! Only negatives were the landscaping is a bit neglected and could use a good clean up trim, and the pool was not ready when we got there. Otherwise the house was in good shape and well equipped. The neighborhood is nice and centrally located. We had a great holiday in Hilton Head. The Starfish Cottage had everything we needed. We really enjoyed the pool and large family room. The Sea Pines resort has many things to do. We went to the beaches, horse back riding, biking, shopping. There are many restaurants in Sea Pines and also right outside the gates. Hope to be back soon. 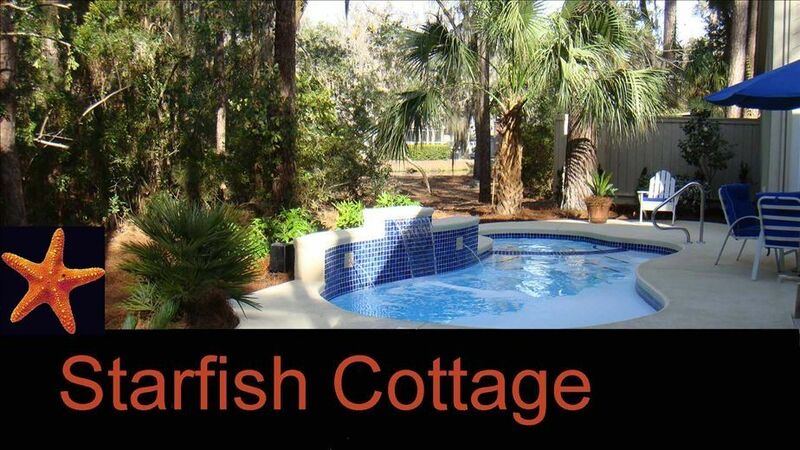 Starfish Cottage is in the Greenwood Forest neighborhood, in Sea Pines Plantation, on Hilton Head Island. At your doorstep are an array of activities, including world-renowned golf and tennis as well as biking, hiking, fishing, and lazy days at the beach. Tennis players can use the FREE Greenwood Forest court or may opt for one of Sea Pines' nationally-ranked tennis clubs with lighted clay courts. Guests are welcome at the clubs. World-class golf within Sea Pines awaits you, with the beautiful Ocean course, the Pete Dye-designed Heron course, and the magnificent Harbour Town Links clubhouses all within a five-minute drive from the house. You can also enjoy dozens of other courses on Hilton Head Island. Golf: Sea Pines Plantation Resort has three spectacular golf courses available to our guests that are just a 5-minute drive from the cottage. The rest of Hilton Head Island provides many more golf opportunities, all within a 15-minute drive.